From Marvel to DC Comics, Deadpool, Star Wars, Bill / Ted’s great adventure, Game of Thrones and many more popular film and TV franchises these mystery packs are filled with amazing t-shirt to add to your collection. 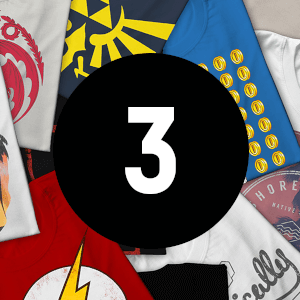 Available in 3, 5, and 10-packs you definitely don't want to miss out on our Mystery Geek T-Shirt bundles that feature all manner of Geeky Goodness to show off to your friends. You won't be disappointed by the awesome handpicked selection of Shirts that we're bundling into this sweet selection. 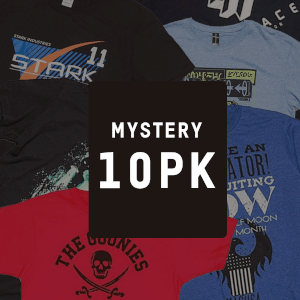 Grab them now and kit out your wardrobe with our great selection of Mystery Tees now! Available in up to 3XL in Mens and 2XL in Womens. Each t-shirt included in a bundle will be unique. Purchasing multiple bundles may result in receiving duplicate t-shirts.